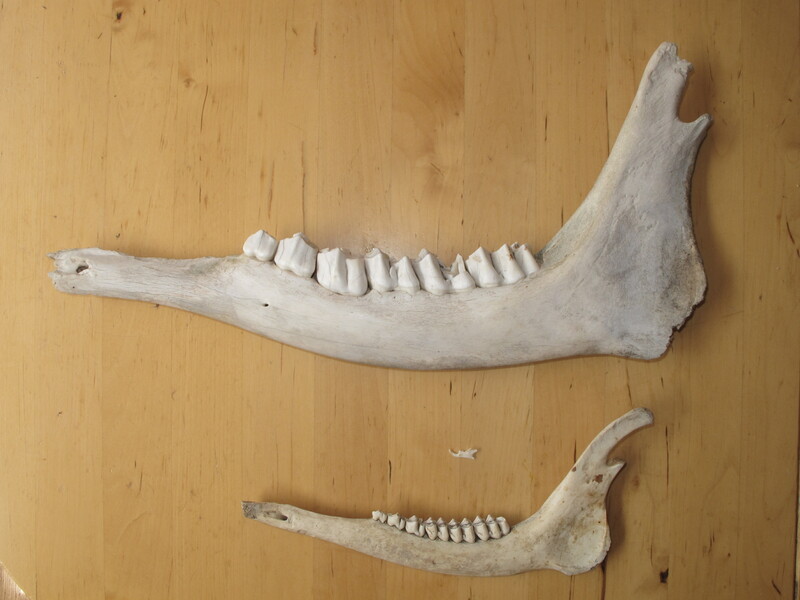 Compare teeth from herbivores and carnivores, using real jaws if possible. Or just use the jaw of one kind of animal, as part of another lesson. An animal's teeth is an adaptation for the food that it eats. Herbivores have teeth that are adapted to smash up plants. Their incisors at the front of the jaw (these are often missing from a found jaw) snip off the plant stems and leaves. To grind the plants they use their molars, which have sharp ridges on the top and fit together perfectly to smash the plant cells open. Insert the jaw bones in the skull and show how tightly the teeth fit together. Show how the jaw moves sideways to mash plants between the teeth. Carnivores need sharp teeth to catch prey and rip meat. Canines are huge, and even on domestic animals they can be terrifying (show cat and dog photo). Incisors are tiny. The molars are sharp to shred meat. We are omnivores - are jaws and teeth are adapted to eat both meat and plants. Canines are there but small - between the two. Incisors are more like herbivores though no where near as big. Molars are between the two. Students are distracted from the task at hand (looking at their teeth) with the mirror. Try looking in partner’s mouth for different kinds of teeth. The students were very interested in the different herbivore jaws.